The last ship of the first class of German "Dreadnought” battleships was Ersatz Baden/Posen. The keel for Posen was laid on 11 June 1907 at the Germania Dockyard in Kiel and launching followed on 12 December 1908. The President of the Prussian province of Posen, von Waldow, gave the christening speech and the christening was performed by Fürstin (Princess) Johanna von Radolin. Posen was named after the Prussian Province from 1772 to 1919, and today is known as Poznan province in Poland. On 28 April 1910 Posen was transferred from her construction yard to Kiel Imperial Dockyard and on 31 May was commissioned for the first time. The first pre-trials began on 18 July 1910. Modellers will find this invaluable regardless of which approach is taken to replicating Posen or her class-mates, with more than sufficient minutiae covered to satisfy the most ardent detailer. 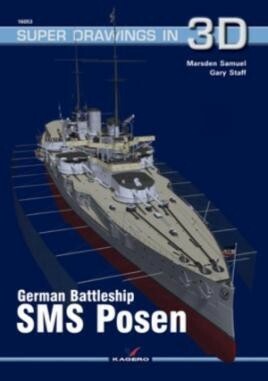 This is an ideal book for the model-maker wishing to scratch-build the ship, or for the armchair historian. As we've come to know what to expect from this series I can't really say much more, other than if you're a maritime fan you really should have them all in your reference library. Very highly recommended. 3D drawings should come in handy not only for superdetailing your model, but also as nice source of information for those who would like to know more about ship they are building or plan to build. A great expanding range of books which I highly recommend. This very well-produced series is in any case thoroughly to be recommended to anyone interested in the major warships of the belligerent maritime nations of the 20th century; the books are a delight to behold and to study.